We’re all Mac users here, but every once in a while—much as we might hate to admit it—we need to run the odd Windows app. Not only will the latest version of Parallels Desktop, announced on Wednesday, continue to handle that kind of task, but it also brings a host of new features, including increased performance, better integration between guest and host OSes, and support for the forthcoming release of OS X Yosemite. Parallels has spent a lot of time fine-tuning performance in this newest version, yielding improvements like 30-percent more battery life for MacBook users, 60-percent faster loading of snapshots, 50-percent faster performance from Office 2014 apps, and 48-percent speedier opening of Windows files. The virtualization software will also make better use of both your disk space and memory, using only what it needs of the former (and, thanks to real-time optimization, cleaning up as it goes), and reducing use of the latter by up to 10-percent less. 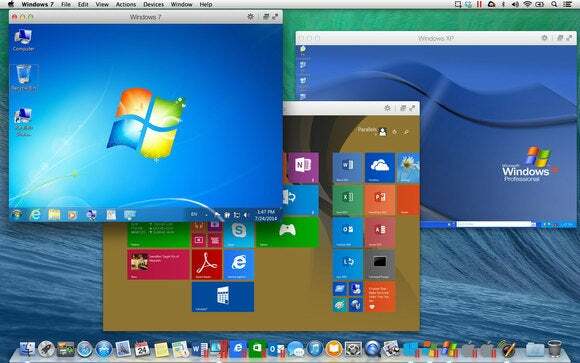 Improved integration between Windows and OS X is also a highlight of version 10. Users will be able to share information from their Windows VM via the services set up in OS X’s Internet Accounts preference pane, such as Twitter, Facebook, Vimeo, and Flickr, as well as Apple’s own sharing options, like email, AirDrop, and Messages. New apps that are installed in Windows will show up in OS X’s Launchpad, and files can be dragged and dropped onto the VM icon in the Dock to bring up Windows—and there’s support for dragging-and-dropping files into virtual machines running OS X as well. The upcoming release of Yosemite provides Parallels with a number of ways to link the two operating systems too. For example, Windows notifications can show up in Yosemite’s Notification Center, and Windows VMs will support iCloud Drive, iMessages, and SMS text sharing. However, since Yosemite is still in pre-release versions, such support may not be fully implemented yet—rest assured, Parallels does intend to fully support the new version of OS X when it’s officially released this fall. Enterprise users aren’t left out in the cold, either. Parallels is also updating the Mac Enterprise Edition of Parallels Desktop, bringing the ability for IT managers to support Windows applications for their Mac users, enforce a USB device policy, or allow for encrypted OS X virtual machines using FileVault. Parallels Desktop 10 is available immediately as a $50 upgrade for current users of Parallels version 8 and 9. It rolls out to new users next week on August 26, though the full version will cost $80. Stay tuned to Macworld for more details on the latest version, including our full review.